It's no secret I fell in love with brownies through baking with Tuesdays with Dorie. Before that I thought they were chocolatey but kind of blah. So I was really keen to see how a recipe called 'Best-Ever Brownies' would compare with what I had made previously! Whether they were amazing or not we definitely didn't need a whole batch sitting around, especially so close to Christmas, so I made 1/4 of the recipe in a mini loaf tin. My altered recipe is below. While I wouldn't say it's the best ever, it was pretty good! I overcooked my little brownie but the very middle was perfect - fudgy and gooey and just divine with a dollop of double cream. 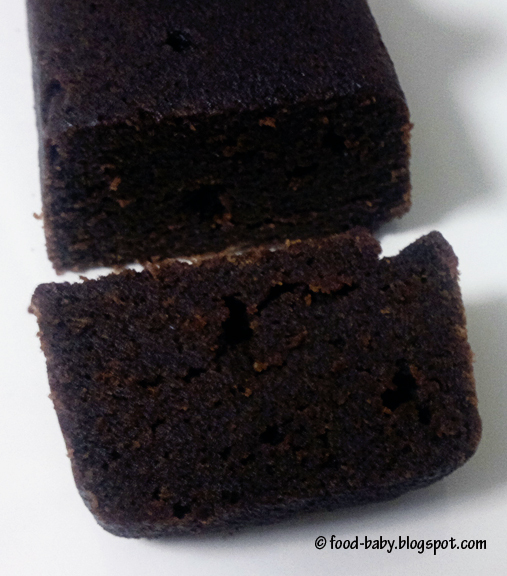 The ends were a little drier but still in a good dense chocolate cake kind of way. My photo in no way does it justice but at 8pm under fluorescent light that's the best I'm going to get! Follow the method as per Baking with Julia p 331. Bake in a mini loaf pan at 180 degrees celsius for approx 16 minutes until firm around the edges and squoodgy in the middle. I gave mine 20 minutes and it was overdone so a few minutes less ie. 16 mins should be pretty close. Our host this week is Monica of A Beautiful Mess so make sure you check out the original recipe! I wish that I had thought to cut back on this recipe. Great idea to make a smaller batch. But I don't mind eating brownies for a day or two. These were yummy, a hit. These were good keepers. They were not my best-ever but they were pretty good. I scaled mine back to half... didn't want to have them staring at me all week! :) Love your mini brownie! Great take on these brownies. They were so good, but I agree, Best Ever needs to really be best ever. And don't you hate losing the daylight window? Like you, most of the time, we cut the recipes into much smaller portions, but this was one exception. The temptation of chocolate ruled. We loved the brownies. I love your mini version! Very cute! I made the full size and my husband and kids had eaten them all by the next day and complained about why I had made such a small amount! Mini batch is a good idea so you can always make more fresh brownies whenever you want. It gets dark so early here in Vancouver now. Definitely a challenge when taking food pictures at night. It almost looks like a chocolate bread loaf - chocolatety goodness! I made these for the Secret Recipe Club posting. They were so gooey and delicious. A real house pleaser!